Have you tried Stonyfield Oikos Frozen Greek Yogurt yet? Unfortunately, I have not yet because I have not found it in stores near me but am so excited to try it. 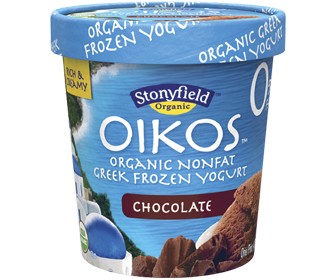 One half cup serving has 100-110 calories and 6 grams of protein which is amazing for an ice cream type product. From the reviews I have read from others, I have heard that this tastes amazing and cannot wait to try it myself. 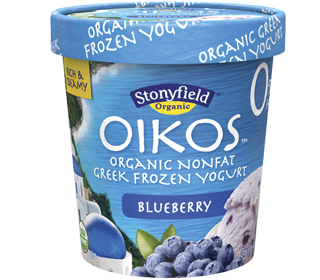 I love frozen yogurt and Greek yogurt and the combination of the two sounds amazing. For now, I have an incredible giveaway for you all to share. I know you will love this one! Stonyfield is offering one very lucky reader a $25 Whole Foods Gift Card and 5 coupons for free pints of Oikos Frozen Greek Yogurt. Wow - those sound yummy! Haven't tried them yet! My favorite kind is always strawberry! 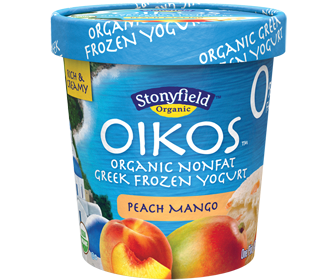 I like strawberry banana frozen yogurt, but would love to try the Peach oikos. My favorite is mango and pineapple! Thanks for the tasty giveaway!! Love froyo and whole foods! I like the frozen yogurt at Yogurtland. Love blueberry. Thank you for the great giveaway! PEACH!!!!! God I want this soo bad!